Diamond is the traditional gift to celebrate a 60th wedding anniversary. 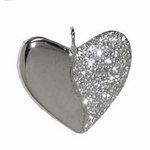 We offer a diamond pave heart necklace in platinum. Both the Modern and Traditional Anniversary Gift List suggest diamond for a 60th Anniversary. Diamonds are among the rarest and most valuable of gems. Diamonds are actually crystallized carbon formed over eons, under extraordinarily high heat and pressure. The best are pure and clear, with a shimmering brilliance and fire within. Diamonds also have an inner strength and is the hardest natural material that exists. They take light, reflect and refract it, bringing out the hidden colors within. The way that diamonds are often judged as gemstones is according to the 4 C's: carat (cut, clarity, and color). A carat is a measurement of weight. Natural diamonds increase dramatically in price, as their weight (and proportional size) increase. Cut describes the diamonds overall shape, the number of facets and proportions they've been cut to. It allows a diamond's brilliance (brightness, sparkle, etc.) to be maximized. Clarity refers to tiny flaws within the diamond. Inclusions are inside the gem, blemishes are on the outside. All but the finest diamonds, have some flaws. But the highest quality diamonds don't have flaws that are visible to the naked eye. Color refers to the overall color of the diamond. They actually vary from light yellow to colorless. In most cases, colorless (or close to it) is preferred and considered more valuable. There are now man-made diamonds as well. They have many industrial uses, and are also used in less expensive jewelry. Though less expensive and quite useful, these synthetic diamonds are not considered nearly as prized or valuable as natural diamonds. * For the children and loved ones wanting to celebrate this milestone, here are some thoughts: As with the 50th, have a party to celeblate the 60th anniversary couple...their achievement of sharing for over a half century is even more amazing. Before purchasing any gifts for the couple, consider the anniversary couple's age and lifestyle. The greatest gift is the time they have been allowed to share. Make their anniversary day memorable by sharing your time, as well. Maybe create a unique gift card by gathering messages from families and friends. Or possibly cook a nice dinner or take an excursion to a beautiful place. Celebrating the special moment doesn't have to be complicated or expensive. Sure, you can purchase diamond jewelry for the occasion, and we have some lovely choices for you to browse through. But material things aren't really needed to truly celebrate a 60th anniversary.